One death, one false accusation leads to a downward spiral for a samurai sword instructor. For another, it forces him to take up the sword. Blood lust and vegeance. Love and redemption. These are part of the premise of “Burai,” an original play set in feudal Japan. Packed with seven or eight sword fighting scenes, the play promises to be entertaining. But “Burai” is no mere action show. It delves deeper into the human psyche. 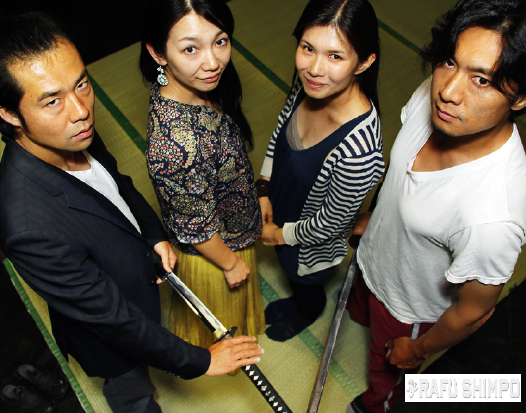 “I wanted to show the American audience not just sword fighting but the Japanese samurai spirit as well,” said playwright and actor Naoki Fujiyama. “Burai” loosely translates to “standing alone,” to symbolize the external and internal battles that each character must wage. While Fujiyama was familiar with the Edo era, he did require some research to ensure the feel of authenticity. Although real katana are not used in “Burai” since it would be too dangerous for the performers, it is no accident that the fight scenes have the feel of a real battle. Kanome and the other performers have been training, intermittently, for the past six months with world-renowned sword fighting choreographer Keiya Tabuchi and sword fighting trainer Tadahiro Nakamura. Tabuchi’s credits include “The Last Samurai,” “13 Assassins,” and “The Floating Castle,” among others, and earlier this year, he was awarded Japan’s Action Award 2014. Nakamura, a stuntman and actor, has worked on “Pirates of the Caribbean: At World’s End,” “The Last Samurai,” “Olympus Has Fallen,” and the “Power Rangers” television series, among others. Fujiyama is very appreciative of Tabuchi’s and Nakamura’s support. With their help, Fujiyama was able to write in realistic duels, rather than fall back on special effects. Hiro Matsunaga, another lead actor, has also had some experience working with Tabuchi, but in order to make his character more believable, he flew out to Tokyo and underwent independent training. Iai-jutsu is similar to kendo and uses controlled movements of the sword. Both performers found the fight scenes most challenging. Kyoko Okazaki plays a lead female role as a samurai wife. Among her challenges was depicting the unspoken love between her character and the character’s husband. Miho Ando portrays the wife of another samurai. “When Naoki offered me this role, I found it quite interesting and challenging so, of course, I accepted,” she said. The performers will be garbed in authentic period pieces, courtesy of world-renowned costume designer Sueko Oshimoto of Suehiro Kimono Agency. Her kimono design won fifth place in the Miss Universe 2013 pageant, the highest ranking ever for a kimono design in the beauty pageant. She has also provided kimono styling for the movie “The Wolverine,” starring Hugh Jackman. It took Fujiyama a month and a half to complete the script for “Burai.” He originally wrote it in Japanese and had Okazaki translate it into English. This is Fujiyama’s third play. Masa Kanome in period costume as a swordsman. Fujiyama wrote his first play more than 10 years ago when he got tired, as an actor, waiting for a script he could relate to. That’s when he tried his hand at writing an original play. Fujiyama’s first script was a bilingual comedy set in contemporary Tokyo, which focused on the interplay between an American exchange student, who spoke no Japanese, staying with a Japanese family, who spoke no English. The play was performed at Centenary United Methodist Church in Little Tokyo and was well received. Fujiyama’s second play, however, came out just when the triple disaster of the March 2011 Tohoku earthquake, tsunami and nuclear power plant meltdown occurred. His play became an afterthought to the tragedy unfolding in Japan. For “Burai,” Fujiyama initially envisioned a small cast and production crew. However, there was such overwhelming interest that the cast ballooned to 20, all of whom, with the exception of a Korean American and Taipei-born performer, are Japan-born. In addition to the performers, there are another 10 to 15 people associated with wardrobe, make-up, lighting, music, set design, etc. The outpouring of interest is perhaps evidence of the dearth of appropriate roles for minority performers. Foreign-born actors also have the added disadvantage of not being native English speakers. Kanome shared about auditioning for a popular children’s show about ten years ago. Although he was told he had the acting chops, the casting director said they couldn’t hire him because he spoke with an accent. He has since improved his English. 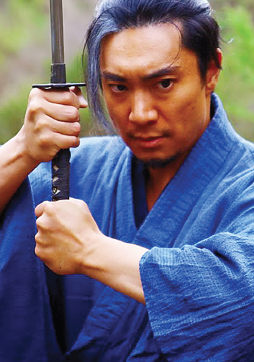 As a result of his past experiences in Hollywood, Kanome realizes how special “Burai” is. “You know, I’m playing the lead in this production, but outside of this theater, I don’t get to do that often,” he said. Matsunaga, who has been working in Hollywood for the past three years, voiced similar sentiments. “It’s not easy to break into television or commercials or films. I’m still aiming at it, but there’s no lead for us. We may get a one-liner or two-liners here and there but even at that, we’re competing against other Asian guys and American-born Asians.…But I’m still enjoying the process. “Burai”is being performed at Theatre Theater, 5041 W. Pico Blvd., Los Angeles, until May 11, Fridays and Saturdays at 8 p.m. and Sundays at 2 p.m. Tickets are $20 online, $25 at the door, and can be ordered at www.eventbrite.com. For more info, visit the play’s Facebook page.